Our Funarena! : Pakistan Back To Inexplicable Ways! Pakistan Back To Inexplicable Ways! As late as the 43rd over Pakistan had the New Zealand innings and the match in control. The expected target was around 220—quite achievable considering Pak batting strength. But mayhem broke loose then. Pakistan already fielded badly dropping several straight forward catches, but the bowlers managed to keep NZ batsmen in check. Shoaib Akhter, the fastest and the most experienced campaigner started it all. Suddenly he became so generous that fours and sixes just rained apart from wides. As many as 28 runs were scored in his 9th and 46th of the innings. Is this the most expensive WC over ever? Other Pak bowlers did no help to their team either. Last 30 balls yielded more than 100 runs! As happens in one day games teams score maximum runs in the last ten, but today after being in absolute control Pakistan seemed to give up. Crossing 250, okay possible. But more than 300 (303 target to be exact) was just the impossible made possible by Pak. When we say Pak bowled horribly in the end we must also say about the incredible batting by New Zealanders. 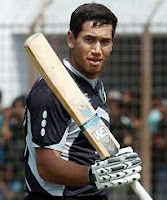 Ross Taylor scored a brilliant century consisting of 7 huge sixes and 8 fours. The seventh wicket partnership lasting hardly four overs was the most destructive from Pak point of view. Nothing much to write about Pak batting. They were just blasted out of the match. With subdued body language the Pak batsmen tried to hit out blindly and fell easy prey to tight NZ bowling. All out for 192. Back at their unpredictable best, Pakistan is capable of doing anything from now onwards. It will be very difficult for them to go back to hard intense cricket of late. With England around just don’t put your bets on any team in the knockout stage. True to cricket anything is possible. India take on Netherlands tomorrow, but days to go for the much awaited Ind-SA and Ind-WI matches. Now Hot Favorites South Africa Knocked Out! Team India Knock Australia Out Of World Cup 2011! A Thriller India Never Deserved To Win! Team India Hiccups Into Quarter Finals!